In the summer of 1919, after less than a year of courtship, Zelda Sayre broke up with the 22-year-old Fitzgerald. After a summer of heavy alcohol use, he returned to St. Paul, Minnesota where his family lived, to complete the novel, hoping that if he became a successful novelist he could win Zelda back. 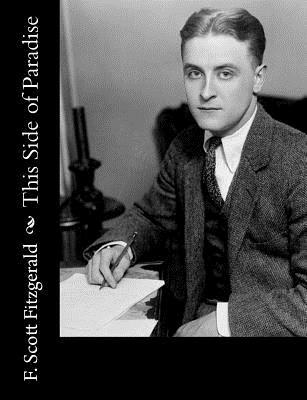 While at Princeton, Fitzgerald had written an unpublished novel called The Romantic Egotist and ultimately 80 pages of the typescript of this earlier work ended up in This Side of Paradise. On September 4, 1919, Fitzgerald gave the manuscript to a friend to deliver to Maxwell Perkins, an editor at Charles Scribner's Sons in New York. The book was nearly rejected by the editors at Scribners, but Perkins insisted, and on September 16 it was officially accepted. Fitzgerald begged for early publication-convinced that he would become a celebrity and impress Zelda-but was told that the novel would have to wait until the spring. Nevertheless, upon the acceptance of his novel for publication he went and visited Zelda and they resumed their courtship. His success imminent, she agreed to marry him. This Side of Paradise blends different styles of writing: at times a fictional narrative, at times free verse, sometimes narrative drama, interspersed with letters and poems from Amory. In fact the novel's odd blend of styles was the result of Fitzgerald cobbling his earlier attempt at a novel The Romantic Egotist together with assorted short stories and poems that he composed, but never published. The occasional switch from third person to second person gives the hint that the story is semi-autobiographic. The book's critical success was driven in part by the enthusiasm of reviewers. Burton Rascoe of the Chicago Tribune wrote that "it bears the impress, it seems to me, of genius. It is the only adequate study that we have had of the contemporary American in adolescence and young manhood." H. L. Mencken wrote that This Side of Paradise was the "best American novel that I have seen of late. Francis Scott Key Fitzgerald (September 24, 1896 - December 21, 1940) was an American author of novels and short stories, whose works are the paradigmatic writings of the Jazz Age, a term he coined. He is widely regarded as one of the greatest American writers of the 20th century. Fitzgerald is considered a member of the "Lost Generation" of the 1920s. He finished four novels: This Side of Paradise, The Beautiful and Damned, The Great Gatsby (his most famous), and Tender Is the Night. A fifth, unfinished novel, The Love of the Last Tycoon, was published posthumously. Fitzgerald also wrote many short stories that treat themes of youth and promise along with age and despair. Fitzgerald's work has been adapted into films many times. His short story, "The Curious Case of Benjamin Button," was the basis for a 2008 film. Tender Is the Night was filmed in 1962, and made into a television miniseries in 1985. The Beautiful and Damned was filmed in 1922 and 2010. The Great Gatsby has been the basis for numerous films of the same name, spanning nearly 90 years; 1926, 1949, 1974, 2000, and 2013 adaptations. In addition, Fitzgerald's own life from 1937 to 1940 was dramatized in 1958 in Beloved Infidel.